… is approaching a planetary-scale critical transition as a result of human influence. 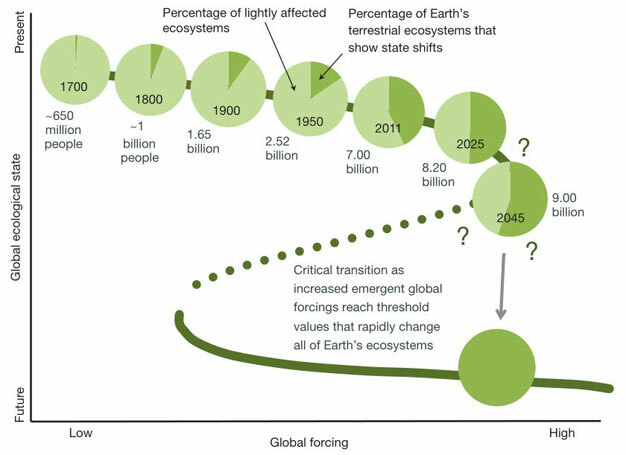 The plausibility of a planetary-scale ‘tipping point’ highlights the need to improve biological forecasting by detecting early warning signs of critical transitions on global as well as local scales, and by detecting feedbacks that promote such transitions. It is also necessary to address root causes of how humans are forcing biological changes. Diminishing the range of biological surprises resulting from bottom-up (local-to-global) and top-down (global-to-local) forcings, postponing their effects and, in the optimal case, averting a planetary-scale critical transition demands global cooperation to stem current global-scale anthropogenic forcings. This will require reducing world population growth and per-capita resource use; rapidly increasing the proportion of the world’s energy budget that is supplied by sources other than fossil fuels while also becoming more efficient in using fossil fuels when they provide the only option; increasing the efficiency of existing means of food production and distribution instead of converting new areas or relying on wild species to feed people; and enhancing efforts to manage as reservoirs of biodiversity and ecosystem services, both in the terrestrial and marine realms, the parts of Earth’s surface that are not already dominated by humans.